Please discuss raw recording issues in the Raw Video section of the forum. Raw recorders (mlv_rec, raw_rec) are just apps that run on top of Magic Lantern core, just like Auto ETTR, Arkanoid, Dot-Tune and many other modules. This thread is for issues specific to the 5D Mark III port (in particular, problems introduced in 1.2.3 that did not exist in 1.1.3). Any messages about RAW/MLV from this thread will be deleted without notice. Not alpha, not beta, nor zeta, just a bleeding edge that happens to work for me. It might work for you or it might not. 1) Format the card from the camera. 2) Make sure you are running Canon firmware 1.2.3. 3) Copy ML files on the card and run Firmware Update. 1) Run Firmware Update from your ML card. - unlike most firmware updates which fix minor things, this one changed a LOT, especially on the display side (for example, LiveView is now quad-buffered and most of the display registers were changed). For photo use (raw overlays, ETTR and so on) it should be just fine (that's how I use it). - the 5D3-123 branch in the main repository. - feel free to merge it locally with unified or experimental branches to get a sneak peek for the future updates. - I'll merge it to unified when I'll be confident it's at least as good as the 1.1.3 branch (based on your feedback). - everyone else who volunteeres their time to make a great community project. - check nightly builds often and stay up to date! I'll do my best to make sure there are no critical issues in the nightly builds. - there are quirks and bugs waiting to be fixed (please report them properly, with details on how to reproduce). - grab the ARM toolchain and start hacking! (start with something easy or just tweak/fix whatever you find interesting). - If anything goes wrong, we don't pay for repairs. Use Magic Lantern at your own risk! Thank you so much for bleeding edge build!!! Finally a build with simplified installer and uninstaller. Your a legend. Going to install this tonight and have fun! Thanks to everyone who made it possible! What will people complain about now that the bootflag is solved? wooooohoooooo...first test seems to be working very good. WOW !!! Don't have a 5D but this is spectacular!! Indeed, a living legend, a living machine legend! Congratulations! Even more people will be drawn to ML now with the bootflag issue solved. Indeed we'll see about this, my theory is that some part of people shying away from the missing bootflag removal are too cautious to try ML at all as it's still widely regarded has a "hack". is it safe now to install ML on a mark iii ? is it safe now to install ML on a mark iii? It's as safe or unsafe as before, it's apparently just easier and and uninstallation is possible. You're still running bleeding edge nightly code usually just tested by one single person, though as alex wrote he's very concerned with safety and thus nightly appears to be effectively the new rolling stable-ish release. Whow, thx you very much..
OMG, THANK YOU! for fixing the bootflag. It was a serious problem for me when it comes to shooting stills. +) when HDMI+LCD mirroring is active, ML acts like it does when Canon displays are ON (so no overlays, neither in camera lcd or in external monitor). Infact, inside ML menu, info bar at the bottom keep saying "Press INFO (outside ML menu) to turn Canon displays off.". 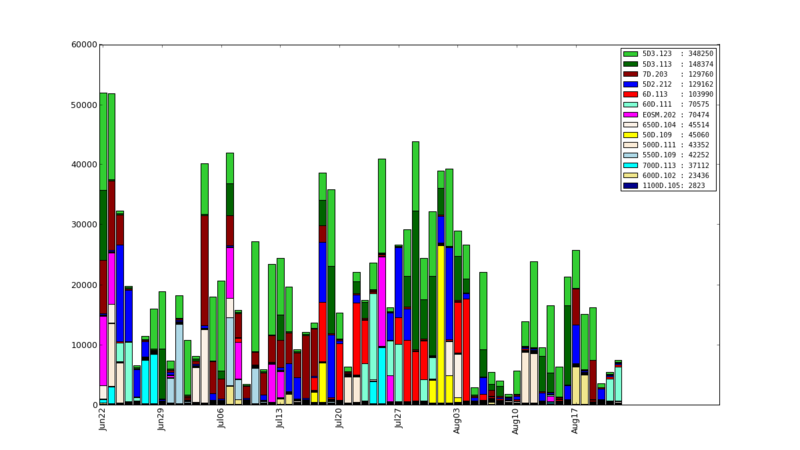 I can tell you that i bout the 5d3 only because of ml raw with 1.2.3.
i waited for that release, refreshing chris overseas topic "how do i dump 5d3 1.2.3" and the bit bucket branch 100 times a day. evan started to learn coding c# ( i know some vb and java) for trying to help. I think that yesterday i was the first one who volunteer installing this version. As i learned by the time A1ex do not release versions before he test it again and again and again. Lots of people waited for that moment. truly a happy day. some of us should also learn not asking when, if you want to get "when" closer to now, just try to help by testing, by coding, whatever. and move this project forward. in the background before acknowledging the use of this battery. Has this to do with the fact that I am using a 64GB SD card? So, if we're mainly using the Mark III for H264 and RAW video, you recommend to stay on 1.1.3 because of the corrupted frames, or it shoudn't happen? Will it be the same as 1.1.3 or worse? I'll try that tomorrow. Thanks. after recording number of mlv recording only one was with corrupt frame and it was the first frame. 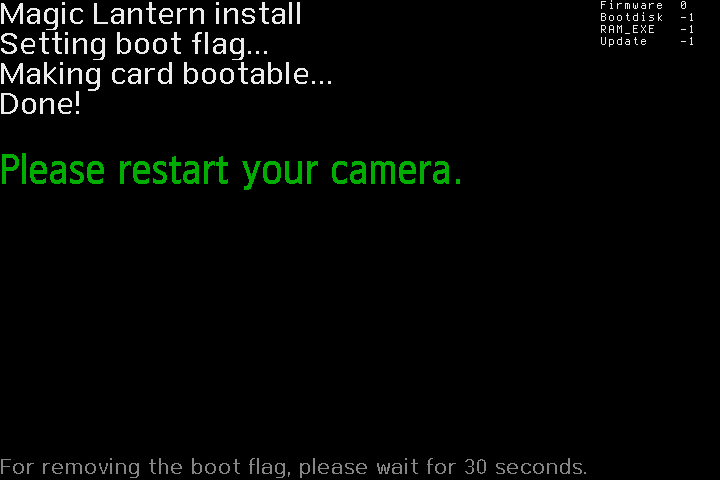 If you have the bootflag already enabled, just upgrade to 1.2.3 Canon firmware, power off the camera, put ML (1.2.3 build) on card, et voilà. First of all, THANKS A LOT for your work with ML! I've been waiting for a 1.2.3 release forever! I installed it but I can't find the M tab for raw video. The M tab seems to be replaces with a triangle symbol tab.